Xiaomi is slated to launch its Mi Play smartphone on December 24th in China. The company has started teasing the handset that will be the Chinese OEM’s first waterdrop-style notch display phone. 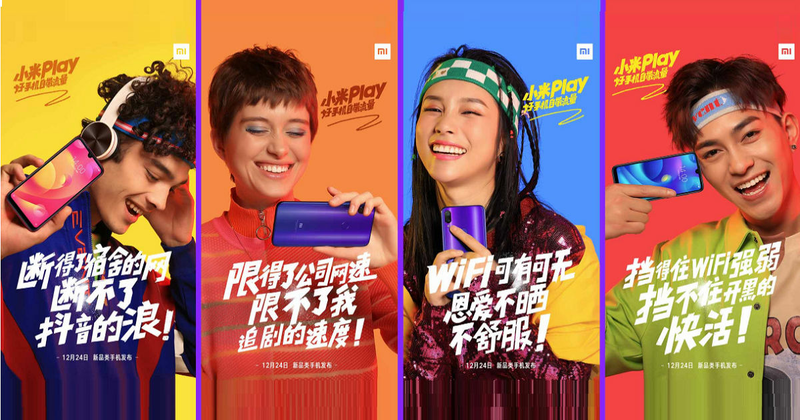 It was earlier tipped that Xiaomi’s Mi Play is the same device that was spotted on TENNA – Chinese certification site – a few days back. However, a new report claims otherwise. A MySmartPrice report dismisses earlier speculations that the Mi Play base model will come with 3GB of RAM and 32GB storage. “The Xiaomi Mi Play will be available in three RAM and storage configurations of 4GB + 64GB, 6GB + 64GB, and 6GB + 128GB in China,” says the report. It’s worth mentioning that the handset is expected to be a gaming device, so 3GB of RAM for the base variant was unlikely since the start. Furthermore, the report points out that the phone will be available in just three shades: Black, Dream Blue, and Dawn Gold. That’s all the report has revealed about the Mi Play smartphone. The handset is going to be the first for Xiaomi to come with a notch atop the display. The teaser suggests that the screen will be edge-to-edge from the top, while the bottom will have a slight amount of bezel. Apart from this, the device is likely to come with a gradient finish with dual camera setup on the rear panel and a centre-aligned fingerprint sensor. A recent Xiaomi smartphone spotted on TENNA is considered to be the Mi Play. This smartphone is said to come with a 5.84-inch Full-HD+ display and a 2.3GHz octa-core processor ticking at its core. The dual rear camera setup of the device is said to have a 12-megapixel primary sensor, while the front camera is expected to be an 8-megapixel shooter. The phone is expected to boot Android Oreo out of the box and house a 2,900mAh battery. We’ll get to know the price and other information about the handset when it’ll be officially announced next week.